Two familiar artists have once again left their mark on Shoreline. 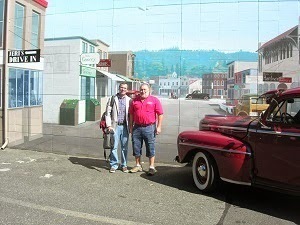 Edmonds artist Andy Eccleshal, known for his Echo Lake mural on 1st NE (see previous article), was commissioned by Jeri Drager, owner of a dealership for collector cars, to paint a unique and classic mural on the south side of his building. Drager’s Classic Car is a dealership for collector cars hidden behind a paint store and appliance store on Aurora across from Sky Nursery at 18805 Aurora Ave N.
The mural shows a street with buildings which could be from the 1940s. If you stand in front of it and have your photo taken, it looks like you have stepped back in time. Car guys and gals, bikers and families pull up to have their favorite cars and bikes photographed in front of his mural. 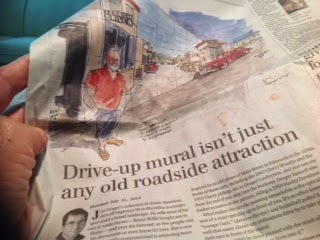 The Seattle Times’ “Sketcher”, Gabriel Campanario, recently did a story/ sketch in The Seattle Times about the mural. (Drive-up mural isn't just any old roadside attraction.) Campanario was last sketching in Shoreline in 2011 when he did the ponies at Ronald Bog and Aurora and the Interurban Trail and the Blue Bridge. This time he made a sketch of Jeri Drager in front of his new mural then posed for a photo himself, with Jeri in front of the mural.